Something I like to do while traveling is visit a supermarket and assemble a meal with local ingredients. In Egypt, Belgium and India, it went a step further and I was privileged to cook alongside the families of strangers who invited me to their homes to teach me recipes, bridging language barriers through love and respect for food. On the flip side, I also like to sample fast food and chips, even if I can’t read the package. Or should I say, especially when I can’t read the package — I want the surprise factor. So far I’ve tried Jamon in Spain, Pickle in Belgium, Seafood and Mayonnaise (Thai import), Greek Kebab in the UK, Limon in Mexico, Paprika the spice and Paprika the bell pepper. I only remember Limon and Jamon with some fondness. At the time I visited India, the flavors were themed around countries or styles and didn’t expressly say what they were although the letters were in English. America was sour cream and onion, Spain was tomato, Mexico chili and lime, and Hip Hop I could not figure out (it was honey and chili). Not content with torturing myself abroad, I also suffer close to home. In Greece I’ve sampled Sea Salt & Fresh Pepper, Prawn Cocktail, Heinz Ketchup, Ham and Cheese, and Tomato and Olive. Yum, yeesh, yuck, better as a sandwich and better in a salad. For years I never bought Rigani (Oregano) because it didn’t sound good, but so many people in my life insist on them that it’s now grown on me. My favorite flavor released in Greece is Tzatziki, circa 2003 and long gone before the Athens 2004 Olympics. When supermarkets stopped restocking them, I knew they’d soon be discontinued and went to every periptero and psilikatzidiko within walking distance to buy them up. I recall they tasted like powdery sour cream, garlic and onion-flavored chips, with no hint of cucumber, spices or seasonings beyond salt. Without Tzatziki to choose from, I fall back on the tried-and-true Salted, Salt and Vinegar, and the occasional Ruffles for homemade clam dip and the pure amusement of hearing Greek friends call them Roo-fless. What chips/crisps have you tried? Like or dislike? On the road to the Peleponnese (on the way to our home in Kerkyra), I found Curry Lay’s. They were pretty amazing. Never found them again. We even go back to the same truck-bus-stop cafe whenever we come back to visit the mainland, and no dice. They do still have the same dusty bags of everything else, though..in case anyone’s interested in 5-year-old Gummi worms. Side note, still chip-related: Has anyone had the same dreadful luck with Tsakiris as we have? I’ve adored Tsaks since the first time I came to GR in 2003…but lately, every bag we’ve bought, from a variety of vendors (including high-turnover-rate supermarkets and perips), has been completely burnt…every single chip! Full bags of inedible chips. I finally stopped asking for them…too frustrating. Only the O.G, salt ones…never tried the Oregano. I got frustrated after burnt bag #7, and quit them in favor of Baked Lay’s (BBQ..they’re meh). Mmm, Curry Lay’s, that sounds good. Can’t say I’m interested in ancient gummi worms, but there are some shops in Athens selling the same thing if I was. They get mad and mumble ‘xeni’ when it’s pointed out. Funny you should comment about Tsakiris. I bought a bag that was burnt also, then got another that tasted stale, like the bag had been left open for weeks. Those incidents combined with the fact they’re more expensive than Lay’s put me off; now I only buy their fried potato sticks. Those are fine. I like BBQ but I don’t buy them in Greece. Too normal for me, I guess. Thanks for leaving a comment, and kalo kalokairi! I know a lot of people who don’t like Heinz ketchup chips, yet Pringles has just released that very flavor in Greece. Puzzling. I admit I don’t remember the Tzatziki potato chips. They seem too Greek to be true, if you know what mean 😉 I do remember though two other flavours: Feta cheese and Tomato & Olives. It sounded like a good idea until I got to try them. One word: awful! And perhaps I wasn’t the only one to think so, judging by the fact they don’t exist anymore. On the other hand, Oregano flavour is quite popular and decent. 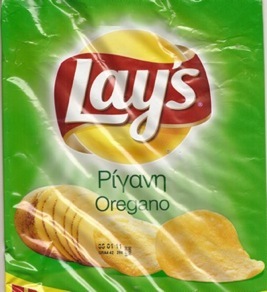 Until now I think it’s the most successful Greek “localization” of potato chips. I grew up in England where crisp (as they are known there) aficionados were blessed with creations such as roast beef Monster Munch, Nice ‘n Spicy Nik Naks and Frazzles. However none can compare to the highly addictive limited edition Marmite flavoured crisp that was introduced and then cruelly withdrawn. In Greece it’s Cheetos’ “pizza” flavour rings that are the first in my basket. Wow, I can’t imagine how those flavours taste. The names all sound a bit frightening, and I’m not a fan of Marmite in its normal form. Did you try any of them? Yes, Cheetos pizza. That’s also popular amongst my Greek friends. I like Cheetos, but the puffs they sell in Greece taste different and I don’t like it better. They tested the market some years back by selling tiny bags of the ‘Crunchy‘ kind for 1 euro, and those disappeared also. P.S. I do say ‘crisps’ in the post above because I have readers from the UK. I really miss the Tzatziki Potato Chips!! I know your comment was an attempt to promote your website, and I thought about deleting it. But I wanted to take the opportunity to tell you that if you want me to link to your website, you shouldn’t reuse my photos without permission (there’s one on the front page), and plagiarizing content from other people is not the way to establish credibility. Educate yourself about plagiarism and copyright infringement, which is against the law and opens you to complaints in which your DNS can remove pages and you can be deleted from search engine results. Love this post! I also do the same thing when I travel. I’ve never tried Tzatziki, but it sounds intriguing. Over here in Canada, I’m missing the Oregano flavour – it’s kind of a less cloying dill pickle. Want to swap chips? I’ll trade you Oregano for Jalapeno Cheddar. I also heard that Canada once offered Bacon; that’s also of interest to me. Good to hear I’m not alone in my chip-tasting travels. I don’t always eat potato chips but when I do, they are the tzatziki kind. DAMN that’s too bad they stopped making these… I was in Greece 2003-2004 so I totally remember eating these. You’d be glad to hear that just this past weekend I did sample some Tapatio Ruffles… mmmm yeah and they were spicy delicioso! I’m glad someone else remembers Tzatziki. And LOL, I’m so jealous of the Tapatio. I can’t look at your blog when I’m hungry; it’s torture to see everything you’re eating. Cute, but: a) Not the same; b) chips would break under the weight of tzatziki. So hmmm, no. I was in Greece 2004, 2005, 2007, and again this August (2011) – and the first three times I was obsessed with the feta chips in the light blue bag. I was so excited to have them again this past month, but I couldn’t find them anywhere! I am SO sad that they were discontinued – devastated, actually. They were the best!! 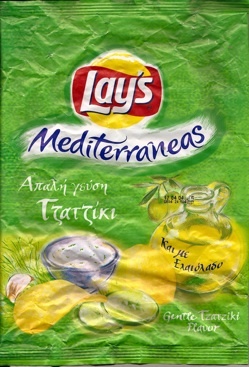 I do remember the Lay’s Tzaziki chips they were the best EVER !!! When I used to go for vacation in Greece I tried looking for them but they were gone… Always hoped they came back but still no luck … Let’s get them back !! !